Philips &Tulpas & Egrigors Oh My! In 1972, the Toronto Society for Psychical Research (TSPR) decided to conjure a ghost. 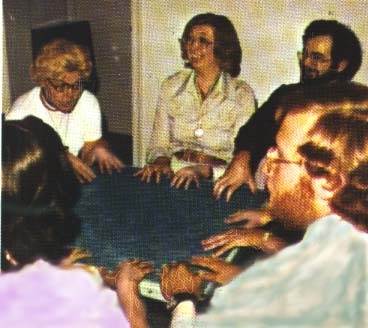 The six men and women, with job descriptions as diverse as industrial designer, housewife, sociology student, and former chair of MENSA, had no particular psychic talent, only an interest in paranormal. Together, they invented Philip—a 17th century Scottish nobleman who killed himself after a love affair ended tragically. One of their number drew a picture of this character, and for a year they meditated upon it and his "history" in hopes that he would make an appearance. Except for a few vague sensations reported by individual members, the experiment seemed a failure. That’s when a psychologist, sympathetic to the group’s efforts, suggested they employ 19th century Spiritualist methods. After all, he reasoned, since they were aiming for classic séance results, classic séance practices might be the way to achieve them. The TSPR pasted pictures of Philip’s castle (a genuine location) on their meeting room walls, lowered the lights, and sat around a large wooden table with their fingertips resting lightly on its surface. Only then did a presence claiming to be Philip begin to rap upon and levitate the table. Once, he intelligently directed a breeze through the draft free basement room. Philip would give correct responses to any question about himself or the time in which he lived, as long as the information was already known to at least one member of the group, or had been agreed upon beforehand. If questions strayed out of his limited area of expertise, his answers seemed hesitant, or were not forthcoming. After a few months of meeting with Philip in the dark, the TSPR turned up the lights and invited in an audience. Philip continued to rap the table, and even drag it around the shag carpeted room. When the peculiar quality of the rapping was analyzed, the sound print showed a buildup to the to the sound’s peak rather than the other way around, as is normal. Philip also rapped on a metal plate specially wired to record vibrations and discourage fraud. He lifted his table about an inch and a half above the ground in front of the group and a film crew, which was caught by surprise and failed to record the event. The methodology used to create Philip has been replicated a number of times with a variety of dramatically backstoried characters. These entities have been cited as evidence of psychokinesis (PK), and related to poltergeist phenomena. In fact, some of the TSPR members reported instances of poltergeist-like activity in their post-Philip private lives. Poltergeist phenomena are usually associated with troubled individuals (often children and teenagers), unlike hauntings, which are associated with locations. If the PK theory is correct, Philip type entities and poltergeists are less supernatural and more a relatively rare and little understood function of the human brain. Or they could be related to egrigors. Egrigors, or "thought forms," are beings brought into existence through the power of intense group or individual thought. An example, cited by John A. Keel in his book The Mothman Prophesies, is a specter which fits the description of the fictional character The Shadow. It has been sighted by a substantial number of disinterested parties over the years in the vicinity of Shadow creator William Gibson’s home, but only after Gibson lived there. If that shade is an example of an egrigor, it is a relatively mild one. Some traditions claim egrigors have been created to serve as sexual surrogates, and a few of those developed into full fledged doppelgangers who murder their creators and take their place. Egrigors have also been equated with elementals (though of a degraded kind) and Tibetan tulpas. Advocates for tulpas contest this association, as egrigors have a bad reputation, but that doesn’t necessarily make tulpas good. For example, explorer and Orientalist Alexandra David-Neel decided to conjure the tulpa of "a fat little monk." After months of directed meditation, it materialized, not only to her, but to other residents of her camp. After a while, the tulpa graduated from her control. It slimmed down and took on a decidedly sinister aspect. At that point, David-Neel decided to pull the plug on her tulpa, and with the help of some Buddhist monks of her acquaintance, re-absorbed his energy. If Philip-type entities, egrigors, tulpas, and poltergeists are projections of human thought, it would explain why so many places that seem as if they ought to be haunted are. This theory also differentiates them from pre-existing, opportunistic beings looking for an entry into the physical world, via ouija boards and the like. Those entities will no doubt be featured in a future Cobra’s Ghost, but will only get the following aside here. In 1994, group of students from Franklin Pierce College attempted to replicate the Philip phenomena. They met with little success, most likely due to the short duration of the experiment, and their laughably slapdash methodology. One night, having again failed to contact their creation Robert, they decided to try reaching him using a ouija board. Several beings (or one masquerading as several, whatever) communicated with them, but sniffily denied any knowledge of Robert. Be that as it may, the different varieties of supernatural entity described above do behave in distinctly different ways, and have specific limitations not necessarily shared by pre-existing or demonic beings. No Philip type entity has yet materialized (though materialization was the primary goal of the TSPR), whereas that is the signature feature of egrigors and tulpas. Egrigors and tulpas individuate, unlike Philip types and poltergeists, who remain connected to individuals. Poltergeist or PK phenomena are not associated with egrigors or tulpas. Differences in the behavior of different supernatural beings are not without precedent. In the Mormon tradition, for example, there is a prescribed method for discerning what kind of (non-human) being might claim to be delivering messages from God. The Doctrine & Covenants advises you offer to shake the messenger’s hand. An angel, being resurrected and therefore having a body of flesh and bone, will take it. The spirit of a "just man made perfect," who is not resurrected but still covered in God’s glory, will ignore your hand and proceed with the message. The devil, being compulsively deceptive, will try to shake it, but being without a body, will fail (and with any luck, become frustrated and go away). In the realm of PK or thought form creation, however, a little human deception seems to go a long way. The darkened environment that facilitated Philip’s appearance set the scene for all sorts of pseudo-Spiritualist chicanery (see "Whatever Happened to Ectoplasm?" from last October’s Cobra’s Ghost). British psychologist Kenneth Batcheldor, who by all accounts has had great success relating to Philip style PK activity, suggests a "designated cheater" is helpful in the early stages of the process. That person produces an initial rap or table tilt in order to relieve group members from the uneasy thought that they are personally responsible for the occurrences to follow ("ownership resistance"), or to get the group past the first, semi-dreaded spooky event ("witness resistance"). Most researchers in this field agree that anybody who hopes to successfully generate the sort of phenomena described above has really to want it to happen, and really believe it will. In any case, the dubious settings and methodologies of the experiments by necessarily biased researchers inevitably shadow the results, however impressive. You should not really indulge in this unless you know what you are doing. I did a lot of work on automatic writing when I was alive and I could never work it out…Carry on trying though because you could soon be close to the secret [of life after death]. If you find it, nobody will believe you.